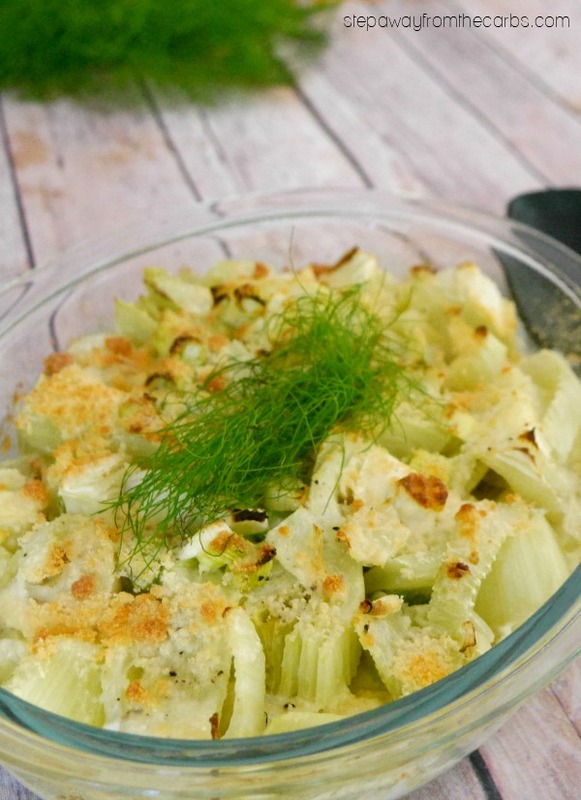 This creamy fennel gratin is a wonderful low carb side dish to go with fish or chicken. I don’t cook fennel very often, probably because my husband isn’t a huge fan. In fact I think this is the first mention of it on the blog – apart from when it is in season! 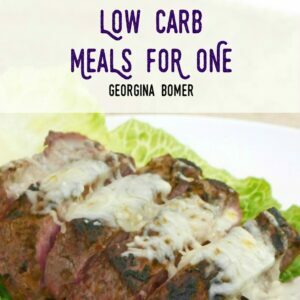 But there is about 10g net carbs per fennel bulb, which can easily feed two as a side dish if you add a few other ingredients. 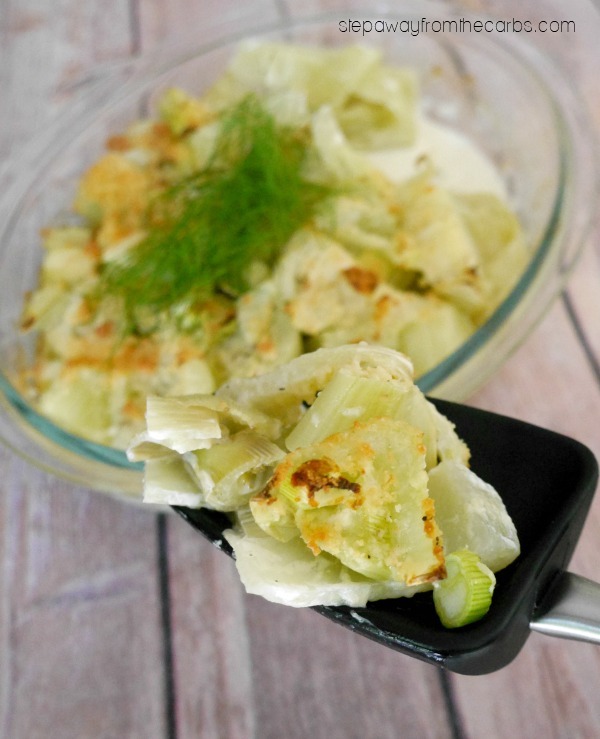 So when my husband went away on business the other week, I got started on this fennel recipe! 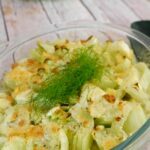 I decided to make an easy fennel gratin (a gratin is a baked dish that has been topped with breadcrumbs, cheese, egg or butter). I topped the dish with grated Parmesan, but feel free to experiment with other types of cheese. Or you could try a pork rind style topping like in my Spaghetti Squash Au Gratin recipe. I’ve paired the aniseedy fennel with cream, which work together perfectly. 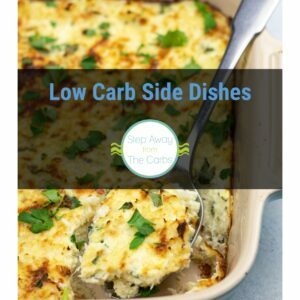 However it does make the dish higher in fat. 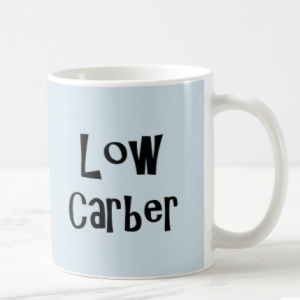 This isn’t a problem for some low-carbers, but if you prefer, try the dish without it! To prepare the fennel, trim the stalks and fronds from the bulbs, reserving some fronds for garnish if desired. Chop the bulbs into small wedges or slices, whichever you prefer. 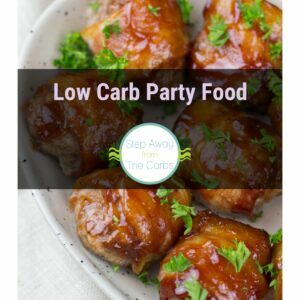 Place them in a microwave-safe bowl with a little water, then cover and microwave for 5 minutes on full power. The fennel should just start to be fork-tender in places. Drain the fennel and transfer to a baking dish. Mix together some heavy cream, garlic paste (or minced garlic), salt, and black pepper. 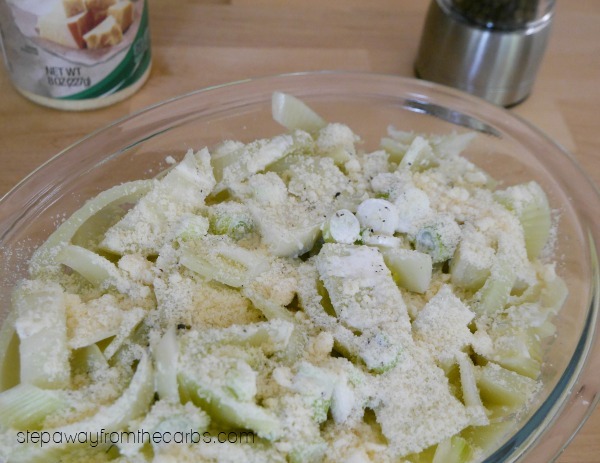 Add some finely chopped green onions and pour everything over the fennel. Sprinkle some grated Parmesan over the top of everything. Bake in a preheated oven for 12-15 minutes until the top is golden brown. Garnish with reserved fennel fronds and serve. This would be the perfect side dish for steamed fish or grilled chicken! 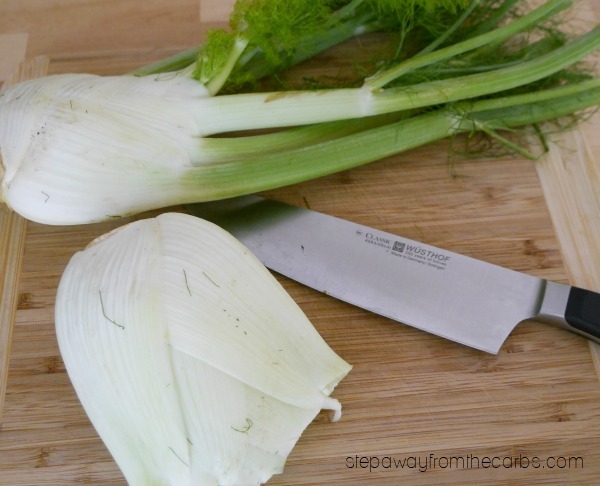 Chop the fennel bulbs into small wedges or slices, whichever you prefer. Place them in a microwave-safe bowl with the water, then cover and microwave for 5 minutes on full power. Drain the fennel and transfer to a baking dish. Mix together the heavy cream, garlic, salt, and black pepper. Add the green onions and pour everything over the fennel. Sprinkle some grated Parmesan over the top of everything. Bake in a preheated oven for 12-15 minutes until the top is golden brown. Oops! Yes it was missing. 380F – now added to the recipe card. Thanks! Thank you for this! I got two lovely fennels from my CSA and can’t wait to try this dish!